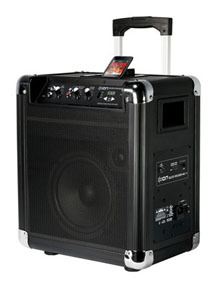 Block Rocker speaker system rentals - perfect for use with microphone to make announcements or hook up to an iPad or iPod to play music at your party. Block Rocker Speaker System - an all-in-one sound system for your iPod, microphone, or other audio sources. You can rock out with BLOCK ROCKER for more than 12 hours on its internal, rechargeable battery or connect to an electrical power outlet. The large speaker and built-in amplifier make this a great speaker for announcements or music to carry throughout small parties. Connect a microphone (included), CD/Mp3 player, or iPod to BLOCK ROCKER and you're ready get the party going, anywhere.